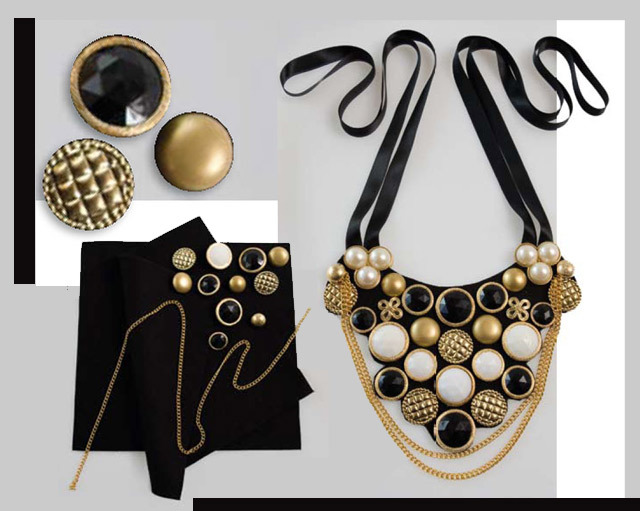 Bib necklaces are an instant way to spice up any outfit, without too much effort. Whether you want to add more glamour to a basic T-shirt, or update a little black dress – these versatile neckpieces are a wardrobe must-have. Create your ideal bib pattern on paper, then cut it out and pin it onto the felt. Cut the felt shape twice – for the front and back of the bib. Take the ribbon and cut it in half. Fold each piece again and secure the two ends to the underside of the bib on either side, using the fabric glue. This creates two loops that you can use to tie around the neck. Starting in the centre and working outwards, create a pattern with the buttons or gems, and then secure in place with the glue. Sew a double layer of chain to the far corners of the bib and then add a button to the same point. Using your fabric scissors, trim around the outside design you’ve created with the buttons or gems. Glue the second felt shape to the back of the bib, covering the glued ends of the ribbons, and trim to fit the top shape. When wearing your bib necklace with a top, the necklace should sit over the neckline like a collar. When wearing it with a dress, complement the neckline, but don’t overlap. For example, simple strapless dresses look amazing when accessorised with a statement bib necklace.